Peg + Cat has an app! Check it out! Peg Cat digital content includes online games, a mobile app and offline activities that engage preschoolers and teach math concepts and skills. Today, PBS Kids launched a collection of new online and mobile games and activities from its newest media property Peg + Cat. The collection includes a new app: the Peg + Cat Big Gig App for iPad, Kindle Fire and other Android devices, in addition to online games and offline activities that families can enjoy together. The new series for preschoolers, premieres on WV PBS KIDS on Monday at 9 a.m. (with a rebroadcast at 3 p.m.) and follows the adorable Peg and her sidekick Cat as they embark on adventures, solve problems and learn foundational math concepts and skills. The zany quandaries that Peg and Cat face happen in a variety of different worlds – from a farm to a distant planet, from a pirate island to a prehistoric valley, and more. 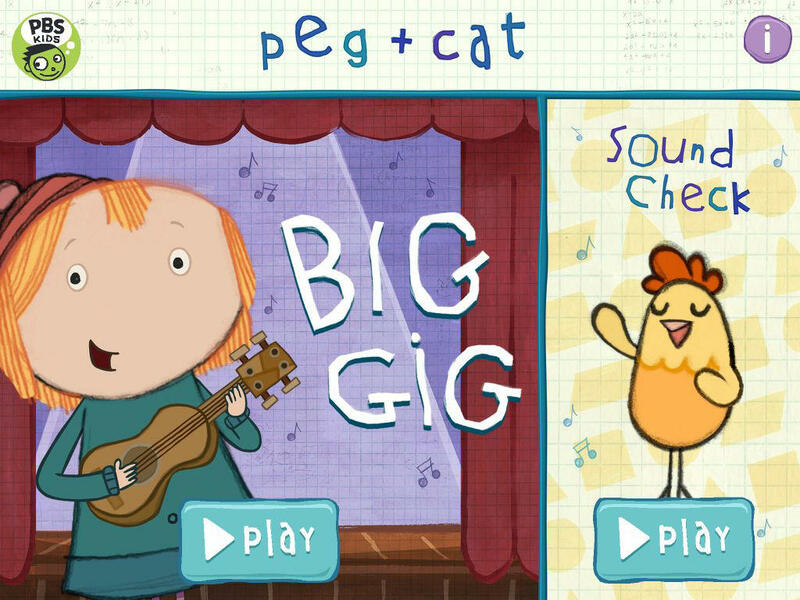 Peg + Cat Big Gig App -- Designed for children ages 3 to 6, the app leverages the original music from the television show to help kids understand math concepts such as numbers, counting, patterns and more. The app includes two activities: "Big Gig" and "Sound Check." Big Gig: Big Gig invites children to pick an instrument and play songs with Peg, Cat and their friends wherever they may be – on the farm, Pirate Island, the Magic Forest, even on the Purple Planet! 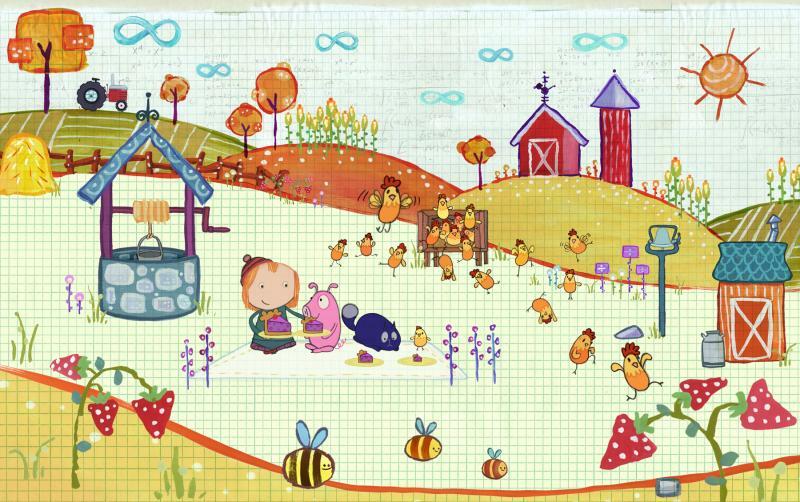 While playing “warm-ups” and simple melodies from Peg + Cat, children practice counting up and down by ones and twos, adding ones, and extending patterns. Once they play the song, the show begins and kids can watch and sing along as the characters rock out. There’s even a karaoke-style feature that helps players follow along with the lyrics. Sound Check: In Sound Check, children are invited to explore and make music on their own. They’ll find a chorus of chickens ready to cheep, musical instruments, song loops, and characters who will sing and shout on cue. Players can even record little ditties and play them back. 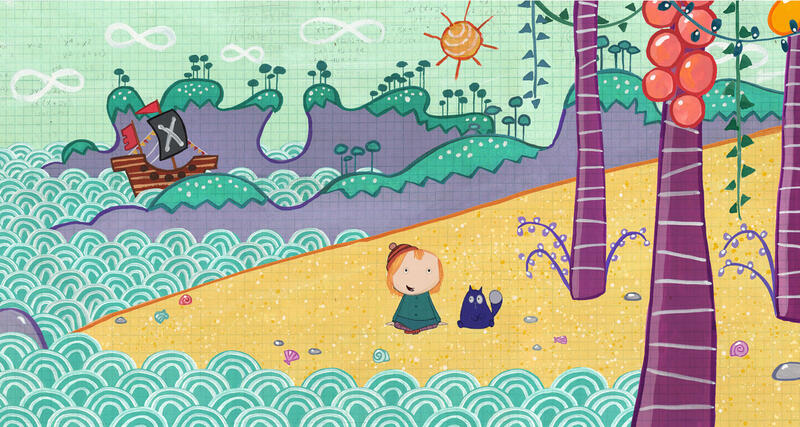 The Peg + Cat Big Gig App is available from the App Store on iPad or at www.AppStore.com/PBSKIDS for $.99. It is also available for Android tablets and Kindle devices in the Amazon Appstore for $1.99. Watch Peg Cat on WV PBS Monday-Friday at 9 a.m. and 3 p.m. also Saturday and Sunday at 8 a.m.
Online Games -- Through this series of online games, players join Peg and Cat as they travel to a variety of whimsical worlds and help complete the “rockin’-est” rock collection in the galaxy. The Totally Rocks collection includes eight online games (each set in a different world from Peg + Cat), plus three open-ended activities, including a global reward system called Peg’s Rock Collection, where players can use these colorful rocks to make art and to practice counting skills. In these games, kids practice counting, 2D and 3D shape recognition and spatial skills, location and direction, and measurement, all while helping Peg and her friends solve a story-based problem. The games, listed below, are all available on pbskids.org/peg and will also be made available to educators on PBS LearningMedia. Peg and her sidekick Cat go on adventures, solve problems and learn foundational math concepts and skills in this new PBS Kids multimedia program for children ages 3-6. Offline Activities -- Related offline activities are also part of Peg + Cat Totally Rocks. Parents and kids can do a variety of things together to explore math along with Peg and Cat. The activities, listed below, are all available on pbskids.org/peg. Peg + Cat flip books that kids and parents can print, cut out and assemble. Recipe: The Pirates’ Great Banana Fruit Salad - Make a tasty fruit salad, counting each fruit yourself. Then turn it into little treasures by dividing it among special, make-it-yourself treasure chests. Courtesy of © 2013, Feline Features LLC. Watch Peg + Cat weekdays on WV PBS at 9 a.m. and 3 p.m.; also on weekends at 8 a.m.